You may recall at the end of July it was Tamy's one year blogiversary and she was sending me a package. Well it arrived on Wednesday and I've been enjoying the goodies she sent me. Hubby loves the caramels, and the Apple Pie Spice smells heavenly! 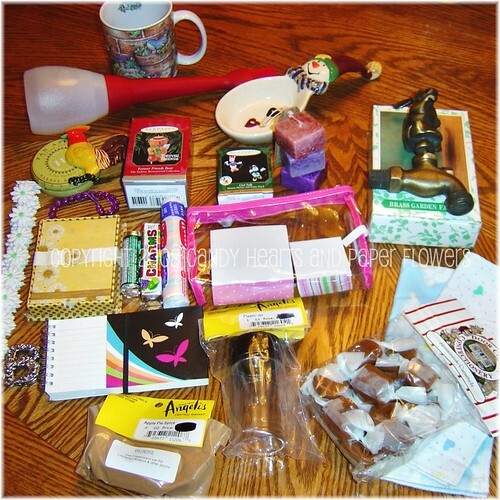 Here's the package she sent me full of so many fun goodies. If you click on the picture I added notes if you are wondering what something is. If you click all sizes from Flickr you can see a much bigger photo as well. I'm glad you liked it! Tell Paul I'll send the chocolate covered caramels during the holidays when it cools down. Thanks again for all your help and support.